Anyone who wants to pop a holiday package in the mail and have it delivered by Christmas without paying extra needs to send it Tuesday. CHICAGO (WLS) -- Anyone who wants to pop a holiday package in the mail and have it delivered by Christmas needs to send it Tuesday. After Tuesday, it will cost extra to get packages to their destinations on time. The deadline for priority mail is Monday, Dec. 21. Wednesday, Dec. 23, is the cutoff for express. The U.S. 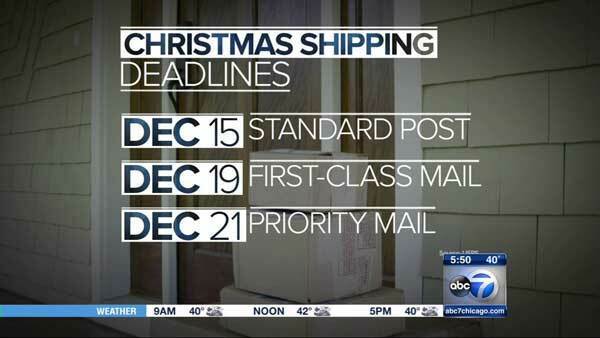 Postal Service expects to ship more than 600 million packages during the holiday season. Monday was its busiest day of the season.